This was the "Sitting Park" that was created in the empty lot over the IND Subway terminal at Perry Avenue and 205th Street in 1955. The old lot had been a great play area since its creation in 1936 when the subway was built. I am not sure what was there before then. This is a photo of my sister Anne and me at Joyland. It was probably taken around 1957. Editor's Note: That's Broadway beneath the IRT Elevated train in background, between 236th and 237th Streets. This is a postcard from the early 1950's of Shorehaven Beach Club on Soundview Avenue in the Bronx. I went there, I worked there, my father helped build it and my grandfather was the Supervisor of the workers. My father's cousin, Edwin Booth, was also one of the owners partners along with Doc Goodstein. Here is another postcard from the early 1950's of Shorehaven Beach Club on Soundview Avenue in the Bronx. This is a photograph of my grandfather's restaurant in the Bronx in the 1940s. 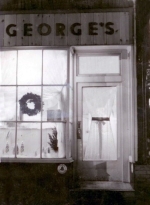 His name was George Paturas and the restaurant was located in the Norwood section of the Bronx on Bainbridge Avenue just off the southwest corner of 206th Street and Bainbridge Avenue. Here is a picture of the benches that ran along the 3500 block of Bruckner Boulevard between Roberts and Buhre Avenues. The picture was taken in 1950. Beyond the benches was Pelham Bay Park. The picture is notable because it is how this area looked before Interstate 95 took over the area. Editor's Note: The car in the foreground appears to be a brand-new 1950 Chevy Styline Deluxe Bel Air. This was the wonderful five story building that I grew up in back in the 50s and 60s. We had two apartments on the fifth floor because we were a large family. My parents were from Italy and they needed a girl to name after their parents. So after giving birth to seven boys my sister finally arrived and they stopped. We had a four-room and a three-room apartment across the hall on the top floor in the back. The address was 237 East 150th Street between Morris and Park Avenues. The owner had an Italian grocery store on the ground floor where we got our bread, milk, soda, beans and other items. Up the street you can see the tower of the Immaculate Conception Church which is still there. Our neighborhood was ninety-percent Italian immigrants where we celebrated three street festivals every year. They were Saint Silverio, Santa Sofia and Saint Antonio. I took this photo from the Fordham Road uptown 4 el station in 1985. The view looks east along Fordham Road past Walton Avenue towards East 188th Street. On the left the theater that used to be the Lido is showing "Johnny Dangerously." I was a boy when I lived on Walton Avenue and attended PS 33. This photo looks north along Walton Avenue towards Fordham Road in 1985. PS 33, not visible in this picture, was on the left side of the street. This 1985 photo shows the back of PS 33 on Walton Avenue with building 2445 to its right. We used to play in the school's sunken courtyard and attend the after-school 'center' activities. In nice weather in 60s and 70s everyone brought out lawn chairs and sat by the school fence chatting well into the night. We kids would run around the corner to Jerome Avenue for pizza, soft pretzels, knishes, or hamburgers at the Telstar.